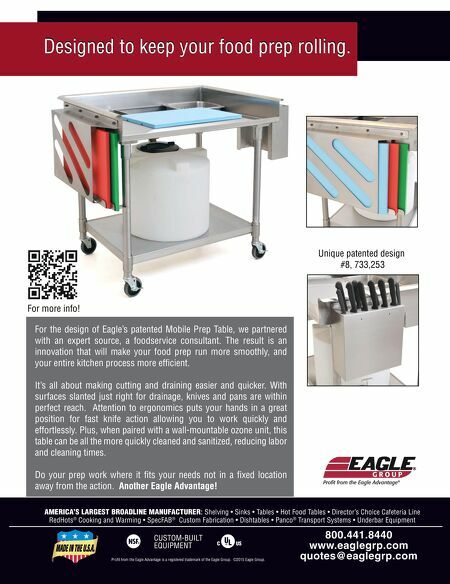 For the design of Eagle's patented Mobile Prep Table, we partnered with an expert source, a foodservice consultant. The result is an innovation that will make your food prep run more smoothly, and your entire kitchen process more effi cient. It's all about making cutting and draining easier and quicker. With surfaces slanted just right for drainage, knives and pans are within perfect reach. Attention to ergonomics puts your hands in a great position for fast knife action allowing you to work quickly and effortlessly. Plus, when paired with a wall-mountable ozone unit, this table can be all the more quickly cleaned and sanitized, reducing labor and cleaning times. Do your prep work where it fi ts your needs not in a fi xed location away from the action. Another Eagle Advantage! Profi t from the Eagle Advantage is a registered trademark of the Eagle Group. ©2015 Eagle Group. AMERICA'S LARGEST BROADLINE MANUFACTURER : Shelving • Sinks • Tables • Hot Food Tables • Director's Choice Cafeteria Line RedHots ® Cooking and Warming • SpecFAB ® Custom Fabrication • Dishtables • Panco ® Transport Systems • Underbar Equipment Unique patented design #8, 733,253 Designed to keep your food prep rolling. Designed to keep your food prep rolling. For more info! Publisher's Perspective: Meet Me in Paris . 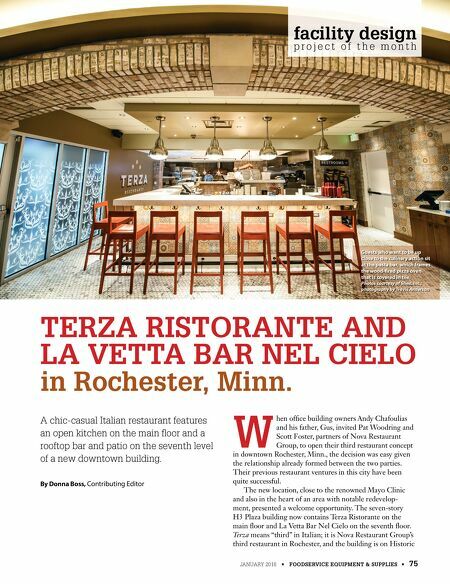 . .
DSR of the Month: Carl Casino, Sales Associate, Culinary Depot, Monsey, N.Y.